While many people assume that proper horse training has to do with repetition and reinforcement, one of the biggest elements that impacts a horse’s memory are the emotional responses it evokes. Whether it’s stress or the joy of eating a treat after a successful practice session, all of these encounters gradually shape how well a horse is able to retain and process information. One particular study that analyzed how these emotional experiences relate to a horse’s memory came from researchers from the University of Rennes in France. The study tested 20 Anglo-Arabian and three French Saddlebred horses to see how well the horses were able to remember a trainer as well as her instructions eight months after they had been separated. The testing process started when the horses were all 1 year old, and the animals were provided with five training periods a day for five days a week. The overall practices taught to the horses were various vocal commands, as well as learning how to cooperate with several grooming and medical exercises. The same female instructor led every training session, and she wore different outfits every day, but always wore the same green coat throughout the entire study. The horse’s behavioral responses to all of the training exercises were recorded and determined to be either positive or negative. Positive responses included things such as licking or sniffing the trainer when rewarded with treats for outstanding performance, while negative responses were labeled as actions such as kicking or biting. Overall, there were 41 steps performed throughout the entire study, and after the entire process had been completed, the horses did not see the trainer or practice the steps again until eight months later. When the horses and the trainer were reunited, the researchers found that when presented with positive reinforcements, the horses remembered all the training steps they had been taught in the past. The researchers acknowledged that, according to their findings, positive reinforcement appears to be extremely effective when it comes to maximizing a horse’s potential for enhancing their memory. While it’s no secret that horses are typically quick learners, there are certainly ways a trainer can tap the full potential of their animal’s memory. Horses tend to be creatures of habit, in the sense that if they see or get away with a certain habit or behavior over time, this type of action can eventually evolve into a routine practice. This means that if you let your horse get away with unruly antics, it may become more difficult to correct this behavior further down the road. A steady combination of repetition and consistency combined with positive reinforcement can do wonders for allowing your horse to maximize its performance capabilities. Trainers should also keep an eye on how comfortable a horse appears whenever you try to teach it a new lesson. Most of the time, anxiety of fear plays into whether a horse is able to properly retain any information. 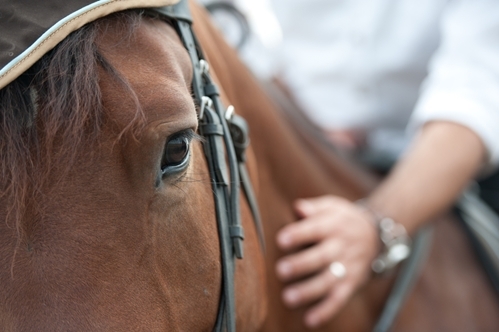 Positive reinforcement is another way trainers can comfort their horse whenever it seems jittery.